The top campaign aide to presidential candidate Hillary Clinton was listed as an editor for a Saudi-sponsored magazine that advocates radical Islam ideas, many of which contradict the campaign pledges made by the Democratic nominee, it has been reported. 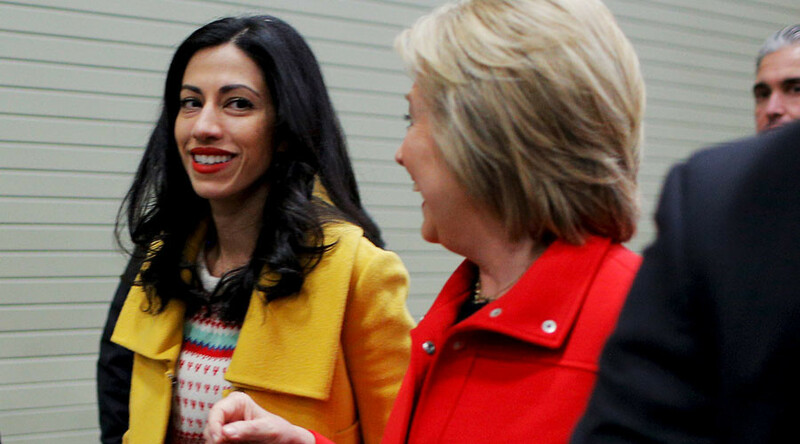 Huma Abedin, 40, has for years been one of Clinton’s closest confidantes. She began her career as an intern in the White House in 1996, when Hillary Clinton was first lady, and was assigned as back-up to Clinton’s primary aide. When Clinton later became senator for New York, Abedin worked as her aide and personal adviser – a capacity in which she has remained ever since, participating in Clinton’s presidential campaign of 2008 as well as the current run for the White House. The New York Post has now reported that from 1996 to 2008, Abedin was listed as assistant editor of the Saudi Arabia-based Journal of Muslim Minority Affairs – a radical magazine where Abedin’s mother, Saleha Mahmood Abedin, is the editor-in-chief. The magazine, issued by the former head of the Muslim World League, promotes traditional Muslim family values that run contrary to the basic principles of Clinton’s agenda as the Democratic presidential candidate. Many of the articles published in the Journal of Muslim Minority Affairs appear to directly contradict Clinton’s pivotal arguments regarding women’s role in the modern family, the of rights sexual minorities, and numerous other issues. In 1995, Clinton delivered her famous ‘Women’s rights are human rights’ speech at a UN women’s conference in Beijing – which has been actively used in her current presidential campaign. In 1996, however, an article was published in the Journal of Muslim Minority Affairs entitled ‘Women’s Rights are Islamic Rights’, evidently opposing the US first lady’s speech in Beijing, where Saleha Mahmood Abedin had been in attendance as a Muslim World League representative. The article accused Clinton and other speakers of distributing a “very aggressive and radically feminist” agenda. The Journal of Muslim Minority Affairs has consistently rejected Clinton’s feminist platform. It has spoken out against women’s liberation and the right for single moms and gay couples to be called normal families, instead advocating conservative Islamic values and ‘traditional’ families. Despite the distinct differences in attitudes between the journal and Clinton, the New York Post reports that Huma Abedin was formerly listed as a Muslim Minority Affairs’ board member and an assistant editor, including on a 2002 issue which suggested the US was “doomed” to go through the 9/11 attacks as a result of the “sanctions” and “injustices” Washington had applied to the Muslim world. Abedin, dubbed Clinton’s “second daughter” by some, was still credited in the journal’s masthead until 2008, when Clinton first ran for president. Following the New York Post report, George Washington University graduate Huma Abedin denied any active role in the Saudi Arabia-sponsored journal. “My understanding is that her name was simply listed on the masthead in that period,” Clinton spokesman Nick Merrill said, hours after the New York Post article was published. He refused to deny or confirm that Clinton’s aide was paid for her collaboration with the Muslim media outlet. “She did not play a role in editing at the publication,” Merrill said. Abedin’s brother and sister have also been listed as the journal’s staff members, as associate editor and assistant editor respectively. The news comes after the former first lady failed to turn over a number of emails to the US government, which were later released after a Freedom of Information Act request and showed donors and associates of the Clinton Foundation and its Global Initiative seemingly having special access inside the State Department. Republican presidential candidate Donald Trump, who began to receive his first classified briefings from US intelligence last week, said he is keeping “abreast” of reports on Clinton’s aides. Last week, it was reported that Trump’s campaign chair, Paul Manafort, who once worked for Ukraine’s former government, had funneled some $2.2 million in cash to two Washington lobbying firms, including the Clinton-connected Podesta Group. Trump’s daughter Ivanka made it into the headlines when a jewelry purchase she had made arrived with a note informing her that the company had donated the money to the Hillary Clinton presidential campaign, a pro-immigration charity and a gun control group. With the presidential campaign reaching its climax, Donald Trump is making an attempt to strip the Democrat-oriented media of the chance to attack. He has hired the head of Breitbart News as his new campaign CEO and has side-lined establishment voices trying to moderate his speech and image.